DEEP ROOTS: Debbie and Jess Herbst live across a pond from their daughter Alexandria and her husband, Andrew, on property that has been in Debbie’s family since the early 1960s. People in New Hope still call it “Roy’s place,” after her father. Jess Herbst made international news when she became the first openly transgender mayor in the state. But back in her tiny town of New Hope, life couldn't be more normal. Alexandria Hull was in bed, reading a book, when she truly saw her father for the first time. It was eight years ago, in Austin. She looked up and there Jeff Herbst was, nervous in a black dress and matching heels, with a long red wig. Maybe it was the box of wigs that had been around when she was little or how, growing up, her father had been more in tune with her feelings than other dads were with their daughters. Alexandria didn’t know, never wondered, but she wasn’t surprised. Then her father sat down in a chair, slumped back, legs splayed, five decades of muscle memory taking over. They left the house they were renting to go get drive-through, her father still in the dress and wig, still nervous to really be seen. Maybe they both were. It was as new to her father as it was to Alexandria. But the woman working the window gave them their food without comment, and that was that. A smaller step than coming out to Alexandria, but still an important one. “I was like, ‘If you want to dress like and be a woman, you’re just going to have to live with the world,’ ” Alexandria says now, sitting at her parents’ dining room table next to her father, today a blonde and—since beginning hormone replacement therapy (HRT) two years ago—a woman named Jess. HOPE FOR THE BEST: Visitors might think the addition to the city limit sign on FM 2933 is about Jess. But she says it’s a joke that’s popped up as long as she’s lived there. Earlier this year, at the end of January, Jess removed the last barrier between her and the world. In an open letter posted on the city’s website, she announced to the residents of New Hope—a tiny town of fewer than 700 people, about 40 minutes northeast of Dallas, where the Herbsts have lived for almost two decades—that she was transgender. 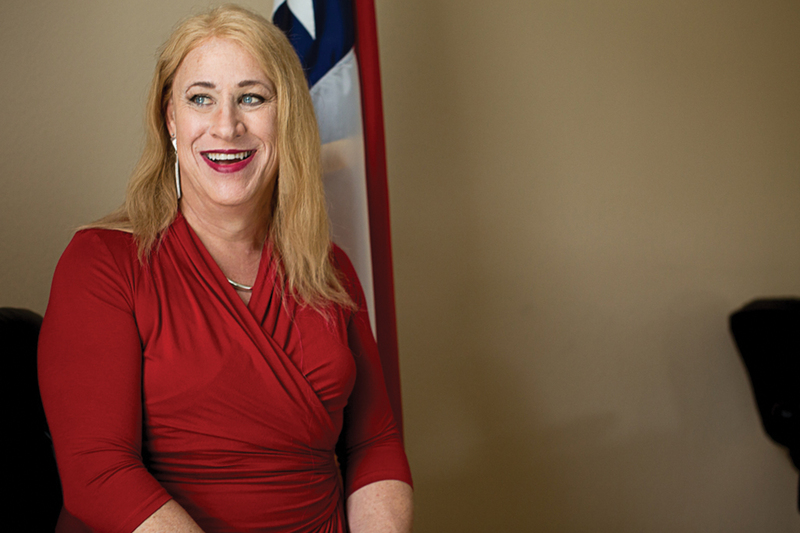 In the process, she became the first openly transgender mayor in Texas. That alone would have been enough for the story to travel as far and as quickly as it did, bouncing from site to site, from the Texas Observer to the BBC, bringing a herd of TV trucks to their front door by the next morning. But the reaction by the townspeople of New Hope—not to mention the fact it happened in a place called “New Hope,” in the middle of nowhere—made it irresistible. There was no outcry, no wringing of hands, no quotes from Leviticus. Just support for a person they’d known for years and who had served them almost as long. They didn’t care if their mayor was Jeff or Jess. They simply wanted someone in the job who would make sure the culverts stayed repaired. It’s a situation Jess Herbst never expected, being the mayor of New Hope. Politics was almost an accidental pursuit, a role she took on because someone had to. Becoming a woman, being a woman, was inevitable, elemental. It’s who she was. It just took a long time for her to understand that. 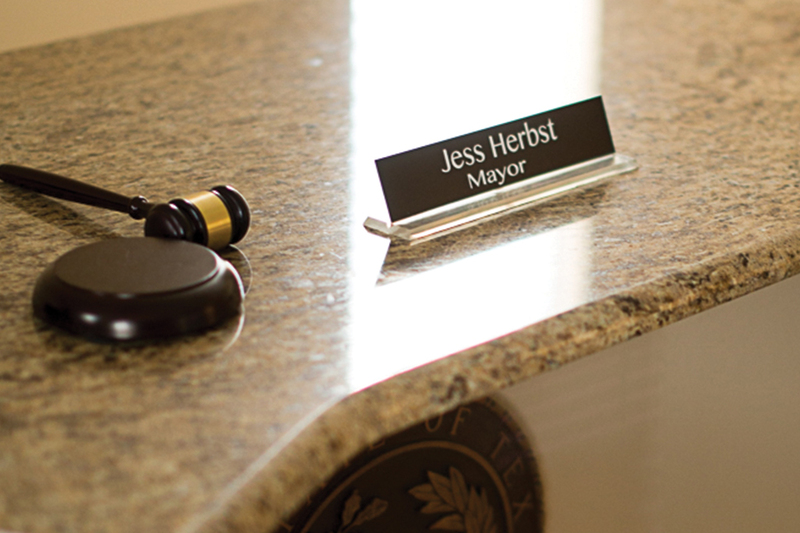 It’s easiest to start near the end, with New Hope and how Jess Herbst became its mayor. “My father-in-law used to say that the great thing about New Hope was that no one knew where it was,” Jess says. That more or less remains the case. It is entirely possible, if not probable, that someone could live in Dallas their entire life and not have heard of the little town up near the East Fork Trinity River. (If that is the case, you are also no doubt unaware of the delightfully named Squeezepenny, a locality, not even a formal town, that neighbors it to the north.) New Hope was settled in the 1850s, but it wasn’t officially incorporated until 1974. And though Collin County continues to grow exponentially, the town has remained virtually unchanged for much of its entire existence. 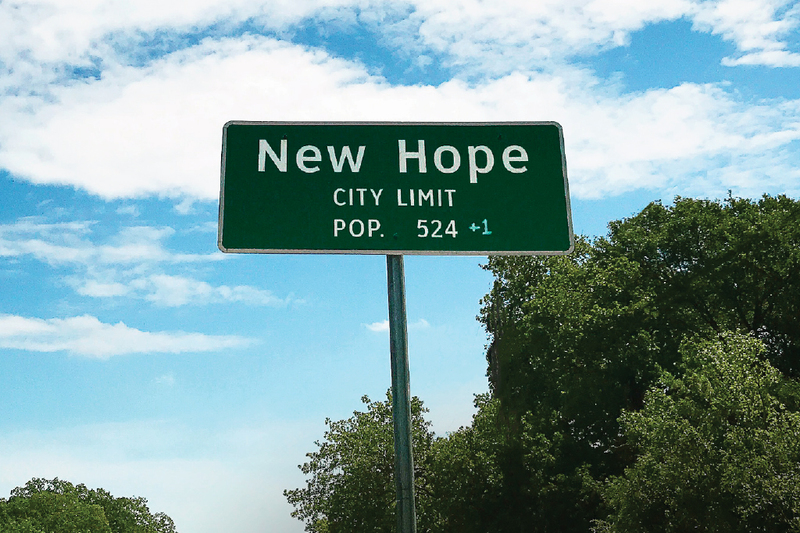 New Hope is known mostly to people in McKinney, its big brother to the west, and to a clutch of Star Wars fans who make the trip up to pose with the city limits sign. Unless you see one of those signs, on FM 1827 or the short stretch of FM 2933 that belongs to it, you wouldn’t even realize you’re in New Hope. The town largely consists of ranches and homes on big lots, with a Baptist church and a couple of mechanics with a shingle out by the road. 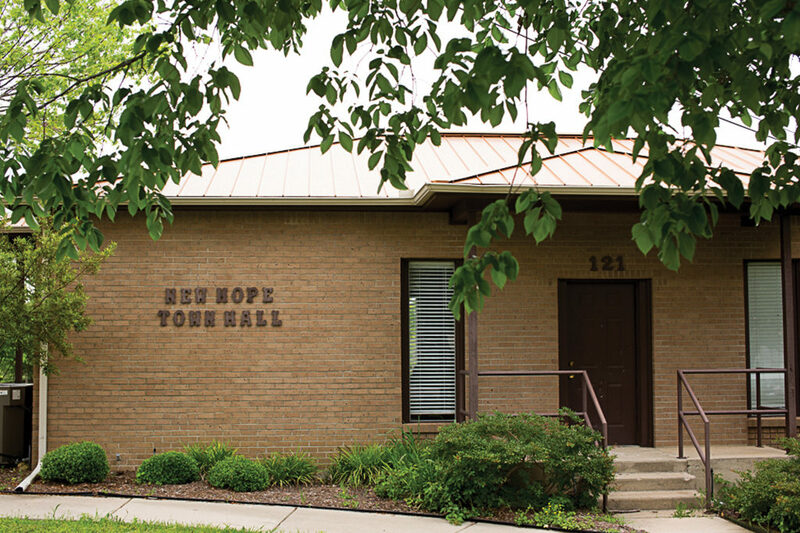 The town hall is a block off 1827, a compact tan-brick building next to a park, which is across from New Hope’s biggest enterprise, Stone Crest Venue, an event space that hosts weddings. In an open letter posted on the city’s website, she announced to the residents of New Hope—a tiny town of fewer than 700 people, about 40 minutes northeast of Dallas, where the Herbsts have lived for almost two decades—that she was transgender. Jeff and Debbie Herbst moved to New Hope in 1999, after Debbie’s father, Roy Gray—who had lived there since the early 1960s, not long after his daughter was born—offered to give them part of his property so they could build a house on what was once his corn patch. 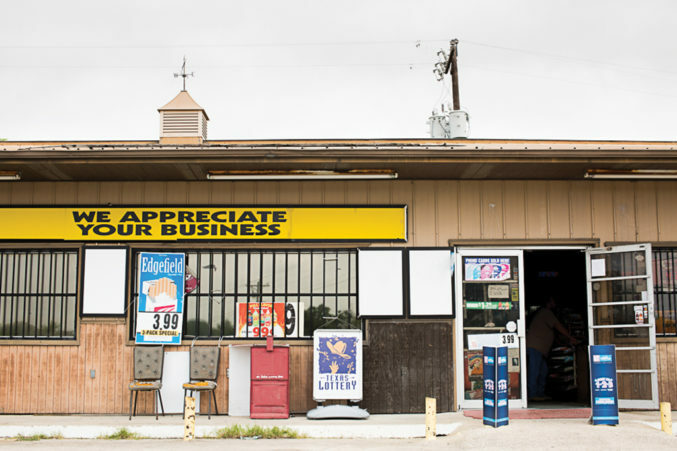 (Roy passed away a few years back, but people in New Hope still call it “Roy’s place.”) Prior to that, Jeff and Debbie had been living not far away, in Sachse, in a 1,400-square-foot house that was getting too small for them and their young daughters, Alexandria and Lauren. Moving to New Hope, across a pond from Debbie’s parents, allowed them to build a nicer home. When the Herbsts moved to New Hope, about 60 percent of the roads were gravel, including the one that ran in front of their new house. The state maintained 1827; the rest was up to the town. Jeff started going to town council meetings with Roy to find out what the plans were for those gravel roads. Six months later, at one of those meetings, the councilman in charge of the roads resigned, and Jeff volunteered to fill the seat. He ran for reelection, and has been on the council ever since. That is probably as far as Jeff Herbst’s career in politics would have gone. And then Johnny Hamm died. Hamm had been the mayor of New Hope since 1994, and no one expected that to change when he was up for reelection in 2016. If he were still alive, it wouldn’t have. Actually, though Hamm had a heart attack in March and died the Thursday before the town voted on May 7, he still won. It was too late to remove Hamm’s name from the ballot, and he beat his challenger, John Miller, by 30 votes. As mayor pro tem, Jeff Herbst had been acting mayor in Hamm’s absence. After the election, the council appointed Jeff and it became official. And so, there was a change of plans. Jeff decided it was time to let the people of New Hope meet Jess. Jess Herbst always knew who she was, even when she didn’t know exactly what that meant. She didn’t have the vocabulary then. No one did. This was Greenville, Texas, in the early 1960s. There was a sign over Lee Street in downtown that said, “Welcome to Greenville: The Blackest Land, The Whitest People”; Jess had a grandfather that had been in the Ku Klux Klan. But she knew. It was her earliest memory. She remembers being 3 years old, maybe 4, and there was a dress that she was drawn to, one of her mother’s. She’d sneak into her parents’ room and put it on. It didn’t fit, of course, but it felt right, like nothing else did. But she wanted to—the high-heeled go-go boots she saw her elementary school classmates wearing, the frilly nightgowns in her mother’s bureau. The latter she’d steal and keep in her room. After going to bed, Jess would put them on and slip under the covers, always making sure to wake up early and return them to the YMCA gym bag hanging inside her closet. Her choice of hiding spot was one critical mistake, she says now. She also admits that she borrowed too many of her mother’s things. In the summer between sixth and seventh grade, Jess came home to find her parents waiting for her, along with the gym bag of purloined nighties. She weakly lied that she was just trying to come up with a Halloween costume. After talking to her for about an hour, the psychiatrist had a diagnosis—Jess needed to man up a little. He had an equally simplistic treatment plan: get into sports. Jess started as a spectator, going with her father to baseball games. When that wasn’t enough, her father told her she was going to play YMCA football. But Jess didn’t want to. The psychiatrist told her father to get a paddle. A few licks, he said, would sort it out. After some paddling, Jess played football for a season, then baseball, which was worse. “I’m horrible at it—I probably couldn’t throw a ball and hit you from here,” she says from across her dining room table. Since organized sports didn’t seem to be the answer, the psychiatrist switched tacks, telling the Herbsts that their pudgy, confused son would feel better about himself if he lost some weight, got into shape. If he looked more like a man, he’d act like one. Jess’ father instituted a strict, daily exercise routine, to be performed whenever his son arrived home from school or playing with friends or wherever, or else face the wrath of his paddle. This lasted longer than football or baseball, but with the same rate of success. By the time Jess turned 14, the daily workouts hadn’t accomplished anything except for this: the chubby kid became strong enough to make the paddlings stop. No one had considered the practical effect of putting an adolescent boy—which Jess was, hormonally and physically—through a grueling exercise routine, fueling muscles that already wanted to grow. “After about two years, I grabbed the paddle out of my dad’s hand, broke it over my knee and threw it on the ground, and said, ‘No more,’ ” she says. But nothing much changed. Jess was still, as far as anyone knew, Jeff. She was still in Greenville, still in high school, still unsure of what that feeling inside her—the undeniable magnetic pull toward femininity, as strong and sure as the tide and just as difficult to grasp—meant. It grew only more confusing when puberty hit and, as she says, her sexual preferences seemed to line up correctly. She was attracted to girls. All she knew for sure was that she couldn’t tell anyone. Her parents, who she calls kind but uneducated about transgender identity, had proven that. Jess constantly imagined scenarios where she would have to dress as a woman—a spy, or in the witness protection program. But she distracted herself from them with girls and a car, the typical high school preoccupations, and kept moving toward an uncertain future. Debbie Herbst has always known who Jess is, even though, for most of their marriage, neither of them knew exactly what that meant. That was okay, as long as they both knew what they didn’t know. They met in college at East Texas State University, now known as Texas A&M University-Commerce. The school drew most of its students from the small towns scattered around the upper reaches of North Texas, kids like Jess and Debbie, who had lived in New Hope since she was 3. They were just friends at first, and at one point even dated each other’s roommates. It was something like fate when the student union hosted a screening of The Rocky Horror Picture Show, still fairly new, and they were both single. Jess and Debbie went together with a big group of their friends and ended up sitting next to each other. “I was all of a sudden thinking, ‘Oh my gosh, I’m really attracted to him,’ ” Debbie says. It was easy with her right away, so Jess told Debbie everything, at least as much as she could. She still didn’t have a name for it, an example she could point to. They disagree on the timing—Jess thinks she first let Debbie know on the second date; Debbie says it might have been a year later—but it was definitely before they decided to get married. And Debbie didn’t have a problem with any of it. Jess says she thinks her wife thought it was cool, a bit transgressive. “We would dabble here and there,” Jess says. She found a pair of sandals at Wal-Mart that just about fit—“It’s really hard to find women’s size-12 shoes”—and she’d put on pink jeans and a little makeup, and they’d go out to Fort Worth to see Rocky Horror, blending in, a safe way to satisfy an urge. It wasn’t their day-to-day but it was something that was always around. They shared their private life with one of Debbie’s best friends. She’d come over, Jess would get dressed up, and Debbie and her friend offered their critiques. Then the girls were born—Alexandria in 1989, then Lauren in 1990, 18 months apart. Jess took measures to keep her feminine side hidden. She grew a beard as a firebreak to stop her from getting dressed up. When she accompanied the girls on Indian Princess campouts with other dads and daughters, she would always offer to build the fire. (“I built this amazing fire,” she says.) Even at home, Jess partially kept up a manly front, scared that people would notice who was really inside. And so it went, until Alexandria and Lauren grew up and moved out. Jess no longer had an outlet for her femininity and less of a reason to hide it. The feelings she had disguised with nail polish suggestions and campfires came back to the forefront, and now she could explore them. The problem was she had no idea where to start. All those years later, Jess was still more or less in the wilderness, lacking not only a map but also a destination. 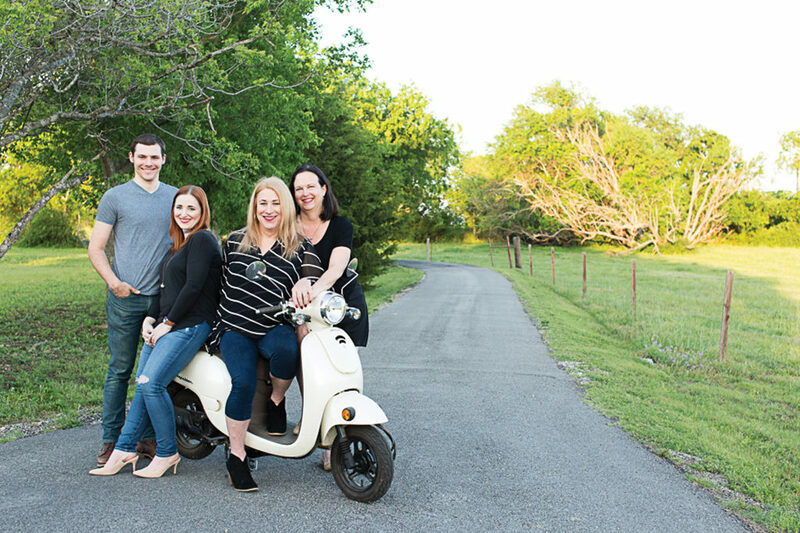 Jess began to find direction when she discovered an organization on the Meetup networking site called Dallas Feminine Expression. Its purpose was to give those who joined a safe space to go out dressed how they felt comfortable. To protect the privacy of its members, it was a closed group, requiring a questionnaire and photos to gain access. It took Jess more than a year to fill out the form. When she finally did, she found there were almost 500 members in North Texas. The administrator of the site at the time was Nikki Starr, who fronted a mostly transgender cover band called Chix. Jess saw that Chix was scheduled to perform at Sue Ellen’s, a lesbian bar in Oak Lawn, and she told Debbie she wanted to go. They went shopping, and Debbie helped her pick out an appropriate outfit. “We went down there and oh, my God: it was a room full of people just like me to varying degrees,” Jess says. Through Dallas Feminine Expression, she learned there was a wide spectrum within the transgender community. She says she found out there are those with extreme gender dysphoria and those who only come out once a year and many more somewhere in between. Some are attracted to men and others aren’t. Jess would come to identify as bigender, meaning she thought of herself as both man and woman. As she got more involved, she became an organizer of the get-togethers, hosting as many as 50 people every Monday at Sue Ellen’s. She was the den mother, always making a point to talk to new members, try to make them more comfortable. Debbie went to the meetings, too, but eventually opted out—it was always talk, talk, talk, she says, and she didn’t have much to say. Alexandria and her husband also accompanied Jess. They were more active participants. It’s an understanding that came to her gradually, as she conquered new territory an inch at a time. It took several years, but Jess got to the point where she no longer needed the safety of the meet-ups. She was tired of driving to Dallas and always having to go to a bar or a club. She started living the life she had imagined. She developed a group of friends, some transgender, others not, and they’d have a girls’ night out every month, go out to dinner wherever they wanted, nothing formal, no need for a website. She knew she could go to Target or Starbucks or wherever as Jess and be fine. Debbie had more of a problem with what was becoming their new normal. She’d tried on clothes for Jess (since they were roughly the same size), attended the Dallas Feminine Expression meetings. That had all been fine. But she was less comfortable going out in public with Jess the more ordinary it became, when it was just the two of them going about the business of being an old married couple. That was the thing: she’d had a husband for 35 years; now, to anyone who happened to notice, she had a girlfriend. When they’d venture out, Debbie kept her distance, avoiding prying eyes. But it didn’t last. She gave up caring what anyone else thought. There were other adjustments, of course, especially as Jess began to figure out who she was as a woman, her style, a ritual she had long been denied. At first, there was the red wig. Debbie never really liked that. Then she was a brunette. Debbie liked that even less: “I’m like, ‘Okay, it looks kind of like me,’ ” she says. At Debbie’s suggestion, Jess settled on blonde. But like her hair, there was nothing yet that couldn’t be changed. To the outside world, Jess was, in a way, an outfit she could shrug off when she needed or wanted to. She could be Jeff, and was while working as an independent IT consultant and serving on the town council. But the longer she was Jess, the harder it was to go back. As the hormones did their work, softening her skin, reducing muscle, redistributing body fat, Jess began the process of coming out. She told friends and family, clients, a cleaning woman, her dental hygienist, bringing it up when it felt like the right time. She was nervous to tell one of her friends, an older man that, she says, some would call “a curmudgeon.” When she told him, he took it all in and seemed to accept it. But when she saw the man the next day, he had a serious look; Jess thought he might have reconsidered. Instead he shared a secret of his own with her, in a show of trust. But she wasn’t hiding, not anymore. It’s not a secret identity, she’d tell everyone after giving her spiel. I’m not a superhero. Still, she hadn’t planned to announce herself to all of New Hope. When the changes in her appearance became obvious, she’d resign from the town council, ending her public life. By then, those who needed to know would know, and, sure, maybe people would talk, but who cared? After everything else, that was easy. She told the rest of the town council (which includes her daughter Alexandria) first. She pulled the other members aside after the November meeting, some on their own, some with their spouses, and let them know who she was, offering to resign if they had a problem with it. No one did. Since the December council meeting is always canceled—no one wants to meet around the holidays—Jess had two months to figure out how to tell the rest of New Hope. She considered going door to door, which was actually possible with only 673 residents, before deciding to write a letter instead. Alexandria, editor of her high school newspaper, and the rest of the family helped polish it. On January 23, Jess posted it to the city’s website and sent a link to the New Hope Nextdoor page, certainly expecting it to be a much-discussed topic among the townspeople, but nothing more. The story of Jess Herbst, the transgender mayor of the tiny Texas town in a conservative county, was everywhere for the next few days and weeks after she posted the letter—BBC News, CBS, The Huffington Post, People, Rolling Stone, Daily Mail, The Christian Science Monitor. But in New Hope, nothing changed. One day their mayor was Jeff Herbst; the next it was Jess. Life moved on as it always had. Someone crashed into a brick wall in the Oak Meadows subdivision and no one can figure out who is responsible for repairing it. That has been the big news. So if you were a reporter looking for any hint of drama at the April 25 town council meeting—and there are three of us in an audience of 18, seated in three neat rows of folding chairs—you would only find it, briefly and barely, during a debate over Collin County Sheriff Jim Skinner’s request for additional funds. Mayor pro tem Bob Parmelee thinks the council should only approve a one-year contract, instead of the four-year, $99,033 deal Sheriff Skinner is proposing. But Parmelee is not exactly vociferous in his objection and votes along with everyone else to approve the measure. Skinner is a big, barrel-chested, square-jawed cop, the kind of man’s man you might expect to have a problem dealing with Jess. And if you were hoping for that, again, you’d be disappointed. “Thank you, Madam Mayor,” he says, a bit courtly, leaving with one of his deputies. The small crowd takes Skinner’s exit as a cue to get up and stretch their legs and talk among themselves, like their middle-school teacher just left the room. “Still meeting, people,” Jess says, banging her gavel. There is another hour or so of agenda items to get through tonight, including discussion of that pile of bricks in Oak Meadows that goes on longer than it probably should and ends up right where it started. The entire meeting—which began promptly at 7:30 and ends at 9:24—is like an episode of Parks and Recreation with all the jokes removed. Road commissioner Terry Sanner mentions five separate culvert repair projects. To my right, a man is making a list of restaurants on a white legal pad, so far only writing down Buca di Beppo and Fadi’s. In front of me, a man named Duke plays solitaire on his phone. A man to my left in a Vietnam veteran cap softly complains about people shooting off fireworks inside the city limits. “It’s gonna be like the music,” he says, to no one. It is boring. It is normal. It is exactly what Jess Herbst has always wanted.